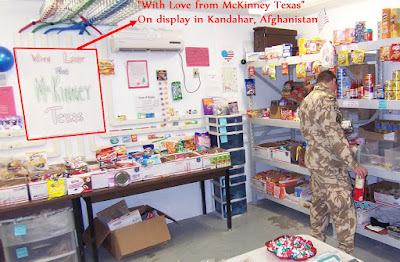 Care Packages for Soldiers: "With Love From McKinney Texas" - Proudly displayed in Afghanistan! 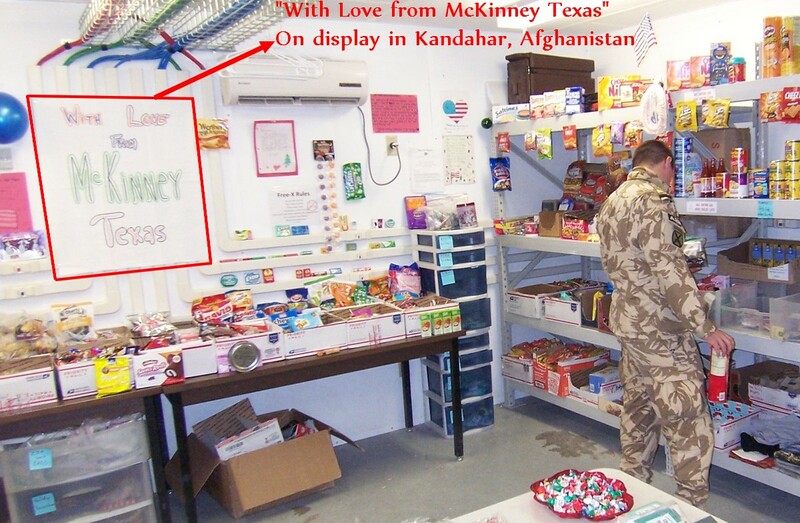 "With Love From McKinney Texas" - Proudly displayed in Afghanistan! "With Love From McKinney Texas" is hung proudly on a wall in Kandahar, Afghanistan! One of our care package contacts, a Chaplain, sent us this great photo of our soldiers care packages being distributed out to the military troops in Afghanistan. On one of the walls is a big and colorful message to the troops from a patriotic supporter in McKinney, TX (just north of Dallas). The Airborne Angel Cadets of Texas have many wonderful supporters from McKinney, including the Walker Elementary PTA that collected a bunch of goodies for the troops for our recent shipments. The photo is a reminder that our U.S. Soldiers, Sailors, Airmen and Marines deployed overseas appreciate the support from Americans back home! McKinney, TX message prominently displayed in Kandahar, Afghanistan!